Why Was Proposition 2 So Hotly Debated? Proposition 2- a case for the legalization of medicinal marijuana- made it onto the ballot for the 2018 Utah midterm election. Shockingly, it was heavily opposed by many Utah voters and organizations (I hope you sense my sarcasm there). A good portion of the public has been led to believe that this would allow marijuana to flow through our streets as freely as alcohol does, which in the state of Utah is really not saying much at all. Opponents to Prop 2 are attempting to convince voters that it will turn Utah into a new oasis for pot smokers, when really all it is doing is providing patients with a medicine that they need, for both treatment and quality of life. 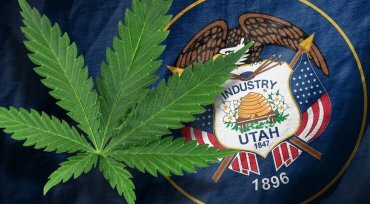 They are under the impression that Proposition 2 does more than legalize only the medicinal use of Utah, but would instead create what Drug Safe Utah calls a “recreational free-for-all”. This is because the program will not be fully functional until 2020, but marijuana will be available for patients before then. It has to be available- it’s a drug after all, it helps sick people. This bill was not put on the ballot for the Harold and Kumar’s of Utah to flood into our grocery stores and buy up all the frozen White Castle burgers. That is an idea that many opponents of prop 2 are not quite getting a handle on yet. Medicinal marijuana is hugely beneficial to those who need it, as any other drug would be. It is so controversial only because of the other effect of the THC chemical found within it. While it is understandable as to why these other effects are viewed as negative in the majority of the Utah public eye, it should be clear that the benefits greatly outweigh the negatives. According to the National Institute on Drug Abuse, medical marijuana benefits patients who struggle with certain mental disorders (such as anxiety), as well as those who suffer from eating disorders. It has also been proven to help those dealing with multiple sclerosis, seizures, inflammation, or any general pain. Marijuana is now also being used in Cancer research, as it has been shown to kill certain types of cancer cells, and reduce the size of others. Alcohol is legal nationwide, as long as the consumer is over 21 years of age. Possession of marijuana, on the other hand, can lead to thousands of dollars in fines and even possible jail time (in all but 9 states). This is where I start to get a bit frustrated. Marijuana is safer than alcohol to consume in almost every measurable way. According to DrugAbuse.com, it is almost impossible to overdose on marijuana, while over 40,000 deaths annually can be attributed to alcohol poisoning. Marijuana actually makes someone less likely to commit a crime, while alcohol enhances that risk. Alcohol affects memory worse than marijuana does, and is also worse to consume while pregnant, though neither should be consumed in that state. Marijuana is not even considered to be an addictive substance, while alcoholism is a major concern for our nation. Even with all of this evidence, marijuana is classified as a schedule 1 substance, on the same level of drugs such as heroin and LSD. I cannot even begin to comprehend how it deserves this classification, but that is not for me to decide, I’m only seventeen after all. As of this writing, Proposition 2 is projected to be approved by Utah voters. This to me is a remarkable step in the right direction, if only symbolically. Currently, the state legislature is constructing a bill that will effectively replace Proposition 2 in its entirety. However, it is likely that this will be approved as well, and that win would be far more than symbolic. Medical marijuana in the state of Utah is now blossoming from a vague obscurity into an actual possibility. People are finally beginning to see all of the upsides, and it’s very exciting to witness as I, an eager voter, sit sadly below the age of eighteen.